Yet his newest, the product of a self-confessed “life’s mission,” may be his masterpiece. 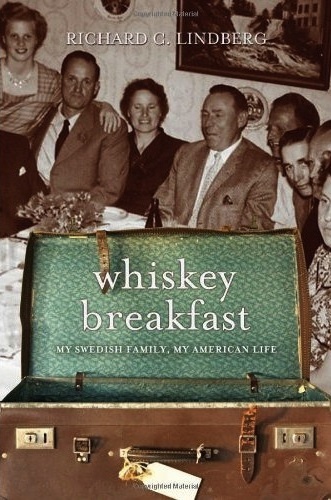 In reconstructing his own somewhat mysterious Swedish-immigrant origins, “Whiskey Breakfast: My Swedish Family, My American Life” is simultaneously a highly personal and unflinching deconstruction of and challenge to both Chicago immigrant and suburban myths. Think of it as the true-life antidote to the popular nostalgic Lake-region movie “A Christmas Story.” At the center of Lindberg’s tale is unraveling the truth behind his father Oscar’s 1924 emigration to the United States, about which he spun a version that disguised that he had come here illegally, a draft dodger under an assumed identity; part of his personal myth was a battery of Old Left ideas that he retained but basically did not act upon even as he became his own “boss,” a Chicago construction contractor. There was an even darker secret, too, that Lindberg has ferreted out. For virtually all of the author’s childhood, his sire was an absent father. Lindberg’s mother was the third of four wives and seemingly innumerable girlfriends of an alcoholic man who managed to keep at both physical and psychological arm’s length the son who most desperately needed him; hence Richard’s older brother bore the brunt of direct conflict with the father. One terrible outcome of an absent father was Richard’s incessant youthful bullying by classmates, an experience that scarred him. It also has certainly colored his experience of the suburban myth of the 1950s and sixties. It has given him the authority to write, “With the troubles of the modern world assailing us, we desperately want to believe the 1950s was the last good decade—a moment in our mass culture when Ward Cleaver and a score of TV dads crafted the proper celluloid image of what the sacred duty of modern fatherhood should be. In young adulthood Richard came to a sufficient truce with his father such that, while still not close, they could spend regular time together; the father remained an enigma, but Richard was finally able to fill in some important blanks. Further closure was made possible by Richard’s discovery after his father’s death of a suitcase stuffed with correspondence between the father and Swedish relatives, as well as Lindberg senior’s own handwritten reminiscences. The son painstakingly worked with his family to get the Swedish letters translated into English. This treasure trove and his lifelong interest in and access to the principles behind his own life’s drama accounts for detailed accounts of events and dialogues to which he was not himself witness. Then, too, there is the extended family Oscar Lindberg left behind in Sweden, among them stalwart missionaries of the Salvation Army. Somehow, Oscar seemed to sustain a positive image with these relatives, through his own correspondence and gifts from America, but there was no hiding the truth from his sons.